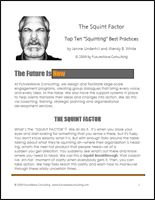 Subscribe below to receive our FREE e-report, Top 10 "Squinting" Best Practices! To keep you updated on news and events as we navigate these uncharted waters, we have created a new E-zine: The Wave Report. Enter your e-mail at the top of this page to subscribe now and receive a special sign-up bonus: our free e-report, Top Ten "Squinting" Best Practices, a guide to the development of this essential skill. Don't miss out on this informative message. Sign up now!